Gerald Webb II, a former assistant district attorney and criminal defense lawyer, was recently sworn in as the newest judge on the Hamilton County General Sessions Court. He is the first African American judge to hold a countywide judgeship in Hamilton County. Judge Webb was sworn in by Hamilton County General Sessions Judge Gary Starnes, using a Bible that once belonged to Webb's father. 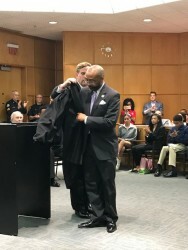 "On this very day here in Hamilton County, it is absolutely unbelievable that this Bible, given to Gerald's father 73 years ago, a time when this nation was segregated, is the very same Bible that will now be used to swear in Gerald Webb," Judge Starnes said at the ceremony, according to an article from WRCBtv.com. Judge Webb is taking the place of Judge Clarence Shattuck on the court. Judge Shattuck recently retired after 36 years on the bench. Judge Webb was appointed to the position by the Hamilton County Commission. "I don't like to be in the promise business, but I promise this: You will never have any reason to doubt this vote," Webb told the commission after his appointment, according to a story in the Chattanooga Times Free Press. "I will do the very best job I can. Thank you again for the opportunity and chance, and I promise I will not let you down." Judge Webb most recently was a partner at Speek, Webb, Turner & Newkirk PLLC in Chattanooga. He is a graduate of Middle Tennessee State University and the Samford University Cumberland School of Law.